The file The Great War v.0.62 is a modification for Hearts of Iron IV, a(n) strategy game. Download for free. 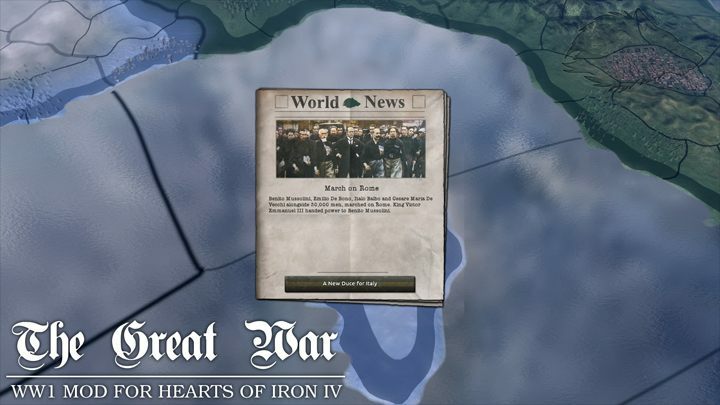 The Great War is a mod for Hearts of Iron IV, created by Wolferos & Friends. The Great War is a WW1 total conversion for Hearts of Iron IV. Start in 1910 with one of the Major Countries of this time and fight through the series of events that lead the world in the first bloodest confict: the First World War. Become a member of the Triple Entente or of the Central Powers and help your side in the Great War. From the French-German border, the Balkans Wars, the Russian Revolution and more to come, this complete overhaul mod includes a new map, new events, new leaders, new governments, new units, new tech tree, new game mecanics and improved AI.